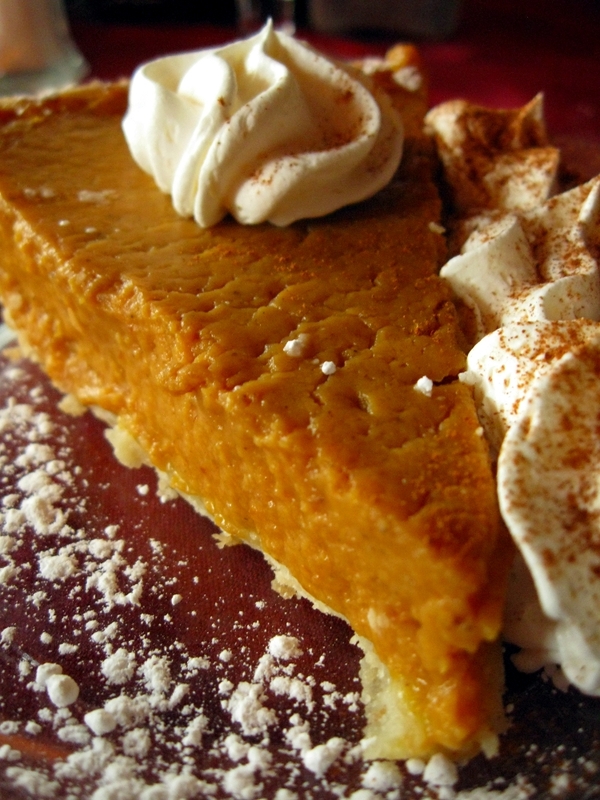 A slice of the fresh Blue Ribbon Pumpkin Pie, with whipped cream. Dessert first, right? Other available desserts were an Apple Cinnamon Cobbler and a Chocolate Coffee Mousse. We’ll be in the Potomac Mills area for Thanksgiving. Does anyone have any suggestions for a decent (i.e., comfortable, pleasant, not fast food) restaurant for 6 or so for dinner? Doesn’t quite matter if it’s a “traditional” Thanksgiving Day meal, although that would be preferred. Alas, the Woodbridge area is not known for its culinary diversity. You might want to come a few miles north on I-95 to Occoquan, a really pretty place right on the river where there are some lovely little locally-owned restaurants … One really nice place in Occoquan is The Garden Kitchen – http://www.gardenkitchen.com/home – I don’t know if they’re doing a Thanksgiving dinner, but I would be surprised if they weren’t … Check out the Occoquan Inn, another pretty place, that IS serving Thanksgiving dinner and taking reservations now – http://www.occoquaninn.com/occinn.php … I wish I could give you better information about the area around Potomac Mills, but, alas, it’s just not designed for gourmands – or even people who want to eat better than fast food … Good luck. Womandingo is quite correct about the lack of diversity around the Potomac Mills Shopping Center itself. The area is loaded with chains, ranging from White Castle to 5 Guys, Denny’s to Chili’s and Applebee’s and just about everything else. It’s just not well-suited for anything close to a “traditional” Thanksgiving dinner, especially a dinner to share with someone who’s had mostly Mess Hall food for months at a time. 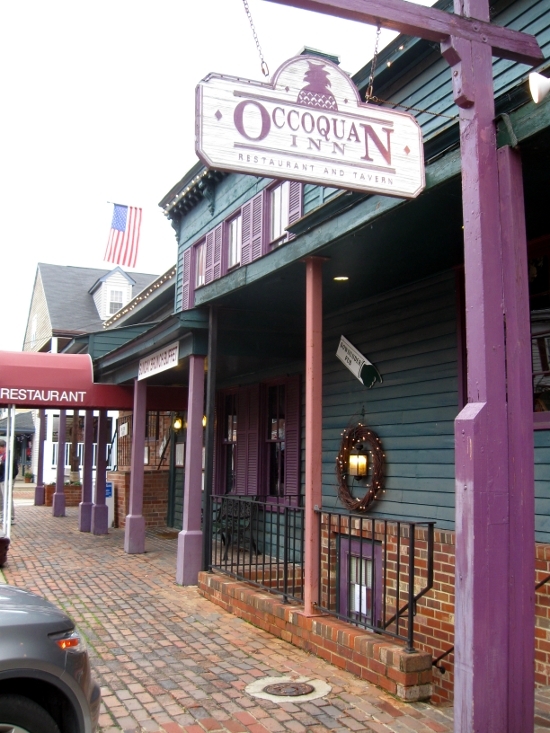 After a couple false starts I finally nailed down a noon reservation for us for Thanksgiving dinner at the Occoquan Inn in Occoquan, Virginia, for their limited menu from noon to 4 p.m., the only time the Inn would be open on Thanksgiving Day. Womandingo’s other suggestion, The Garden Inn, a block away from the Occoquan Inn, was closed for Thanksgiving. 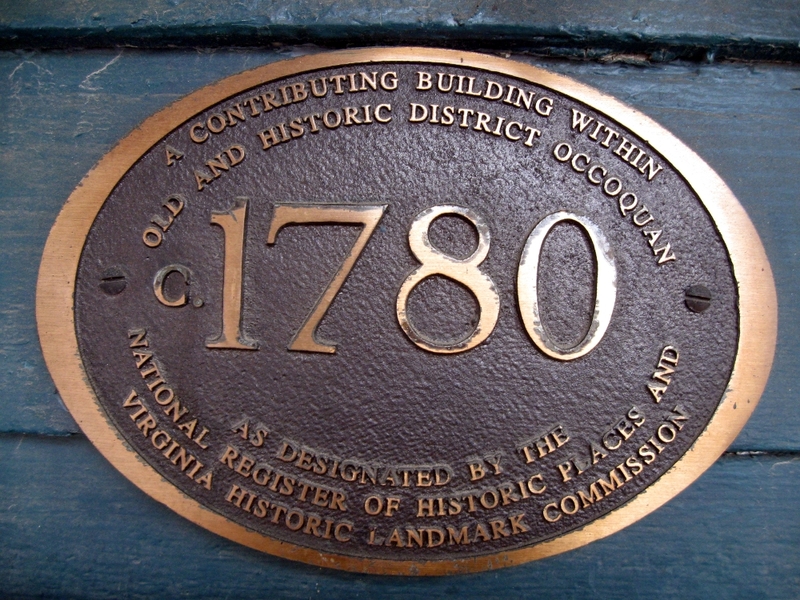 A brass historical marker on the front of the Occoquan Inn indicates the older construction is circa 1780, although the framed copy of the ghost story next to the marker places construction in 1810. The building, the village itself, the river that runs through the valley behind the Inn … this is all authentic older America. 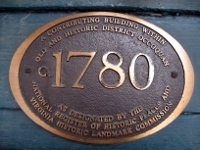 Occoquan’s city hall is a converted one-room schoolhouse, one which is quite similar to the circa 1861 schoolhouse Briahna lives in. We arrived at the restaurant shortly before noon and, as other guests headed behind the Inn to the river, we were the first ones seated. It turned out our reservation was for the table near the center of the front window, making for a beautiful view of the village. By 12:10, the Inn was packed with guests. Mary, John and Briahna after being seated. For the rest of this post, I’ll let the photos basically speak for themselves. This was a beautiful meal. If you have a chance to enjoy eating at the Occoquan Inn as we did, make sure you do. Thanks Womandingo! While you may not think of shrimp as an appetizer for Thanksgiving, Mary’s family does follow this tradition. 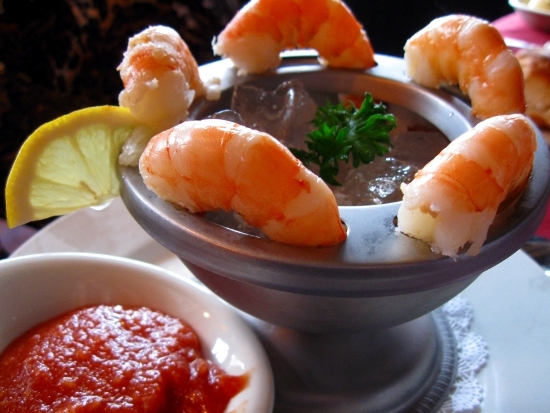 These were plump and flavorful shrimp, with a wonderful dipping sauce. Marinated mushroom caps, with whipped cream cheese with bacon and balsamic. 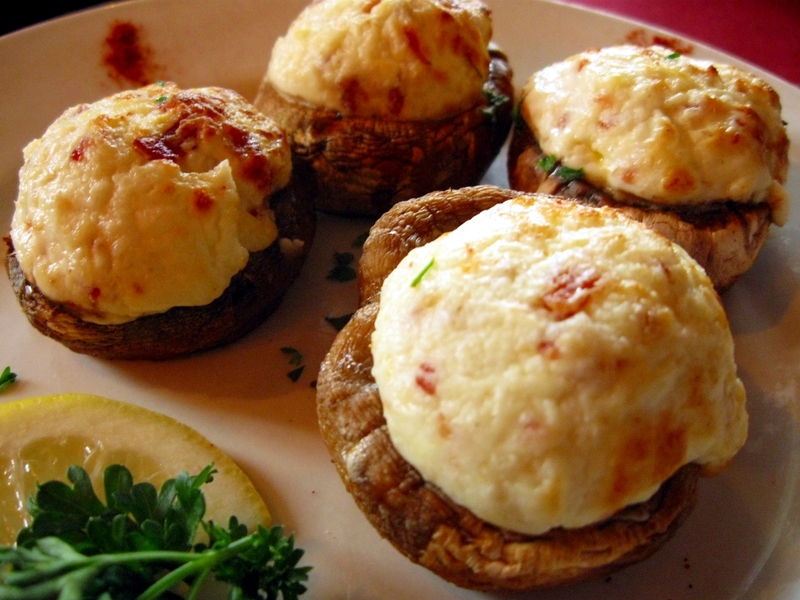 The filling was incredibly light and airy with a rich flavor. Baby spinach salad with hot bacon dressing and boiled egg. The spinach couldn’t have been fresher or crispier. A Ceasar salad was also available, as were a Virginia Clam Chowder and a Blue Crab Bisque. Briahna and I had the chowder and while it’s almost impossible to get a good photo of, it was positively stunning. 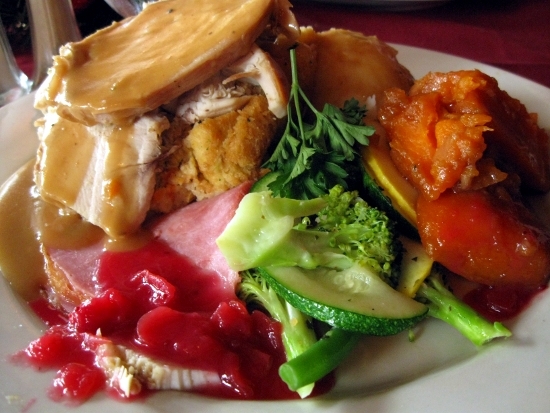 The Traditional Tom Turkey Dinner with roasted turkey, stock gravy, baked ham (which wasn’t listed on the menu), country-style stuffing, sweet potatoes, whipped potatoes, crisp fresh vegetables and housemade cranberry sauce. This plate was huge, piled high, and quite simply, too much wonderful food to finish with desserts in-sight! 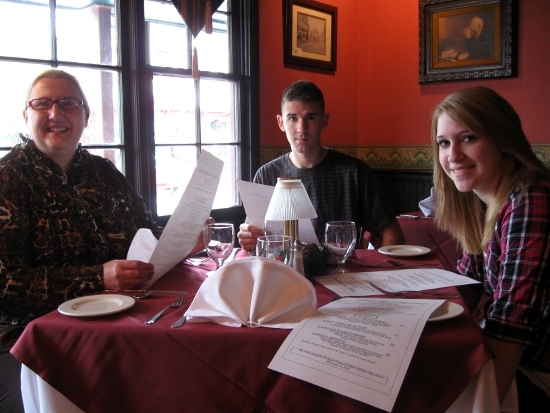 Other available entrees were Roast Prime Rib of Beef with horseradish sauce, Baked Rockfish Supreme in an herb marinade with shrimp and wild rice, and Chicken Imperial stuffed with blue crab and a lemon Hollandaise sauce. Just now getting around to reading your T Day post. WONDERFUL! I’m jealous man. That looks like a lovely place and a wonderful meal. Yea!! Wow, Briahna is so grown up! Where is the time going? Wow. Nice story, Dave. Glad you were able to find an answer via SE. 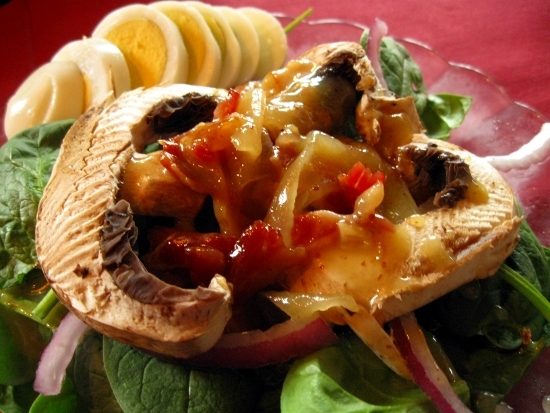 Even better than that was that you had a great meal for Thanksgiving at a hospitable place. Hope your visit to VA was nice.